So recently, I got rid of around 8 bin bags worth of items that were cluttering up our home. While I was decluttering the first room in our home (the living room) I decided that since I was taking everything out of its home to go through it all, I would do a deep clean of the living room as I went along. All of the 25 shelves in our big IKEA unit got cleared out and polished and the top of the unit got hovered as it was a bit disgusting up there! I did the same thing with every room that I decluttered. I took everything off the shelf or out of its cupboard and gave everything a good clean. It took almost a week to completely do each room. The second day, after doing the living room, I did a super quick tidy of the living room first thing in the morning and again in the afternoon. Since it was already done from my huge declutter I was extra motivated to keep it tidy and it was also a motivator at the start of the day to spur me on to keep going. Once you've done your initial deep clean, it's much easier to keep up with things. 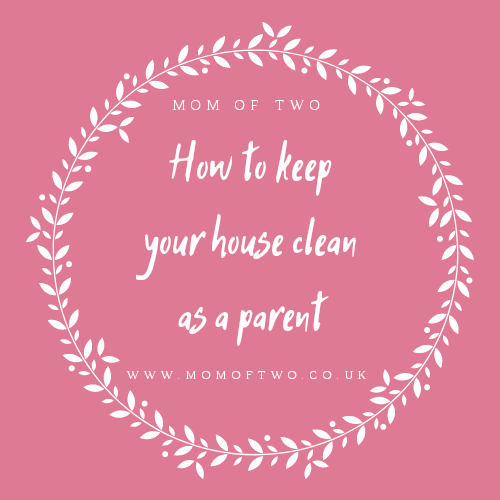 A 5 minute pit stop in each room accomplishes all of the daily tidy up tasks (unless it's the main play area or the kitchen of course) and it's easier to spot any cleaning tasks in a tidy room than it is a messy room. Another top tip is to upgrade your cleaning equipment. Specifically, the vacuum cleaner. I know this isn't feasible for everyone but until recently I had a Dyson ball vacuum cleaner which worked perfectly. The only problem was, it was heavy and a pain to just whip out for a small job because you have to unwrap the wire and plug it in and then wrap it all up to put it away again. For my birthday this year, I asked for a cordless vacuum. My family put together and got me the Dyson V6 Animal and oh em gee it's amazing. It's so lightweight compared to my old one and it's as easy to get out and vacuum up a few crumbs as it is to grab a tea towel to wipe up a spill. Game. Changer. I've gone from hoovering my stairs just once a month to hoovering them multiple times a week! It's amazing the difference that clean stairs makes to how my hallway looks. It comes with a mini head which is perfect for the stairs! If your children are old enough, it's never too early to teach them to put things away after themselves. I found the easiest place to start teaching this was bathtime. We have a net bag that hangs over the bath with toys in it, so as the water is draining away we put the toys in the bag together with very little fuss as they are toys only associated with bathtime. The reason I said bathtime was the easiest place is because if I was to ask my daughter to help me tidy her toys away in the living room she would cry and think it's bedtime or something else that means she has to stop playing for longer than 5 minutes. You can also teach them the importance of cleaning from a very young age. Sophie used to sit and watch me polish and next thing I knew, she'd pulled a baby wipe out of the packet and was wiping our marble fire place just like mommy. This later moved on to her copying me sweeping up and then her wanting to wash up and help me hoover. I try to accommodate her requests as often as I can as I want her to grow up and see it's just something that's part of a daily routine and not something to dislike doing as a chore. She loves mopping and sweeping! My son loves putting things in boxes. (To be honest, he just loves boxes full stop!) He's 13 months old and the very first cleaning up thing he copied was when I was sat on the floor in the living room picking up toys and putting them back into the box. He came crawling over, laughing away and started picking things up and putting them in too! Hopefully this is something I can keep encouraging him to do and he won't see it as an end to playtime like his sister. Now, you may be sitting here thinking it sounds like I have easy children who are happy to play by themselves and let me get on with it. But that's certainly not the case. I have to do my daily cleaning in little segments and time it, usually to coincide with meal or snack times. I can get about 10 minutes of cleaning time when the kids are occupied with food. If I have cleaning or tidying to do upstairs, I take the kids upstairs and they play in Sophie's bedroom. This always gets me a fair amount of time as it's a different set of toys than the ones they are used to in the living room. I can get even longer when Samuel is napping as Sophie is happy to watch a film (Frozen is currently her favourite) or play with her paw patrol toys. If she's being particularly difficult, I set her up a little den in the living room with the ipad and I don't hear a peep for hours! Don't worry though, I don't leave her for hours! Throwing away old toys regularly is another super tip to help keep on top of excess clutter that doesn't need to be in your home. As I mentioned in my previous decluttering post, I now keep a bin liner in the wardrobe so that whenever I spot something that no longer gets played with it goes straight in there and out of the way. Let me know your top tips for keeping your house clean as a parent! I'm always on the lookout for more ways to make life that little bit easier!